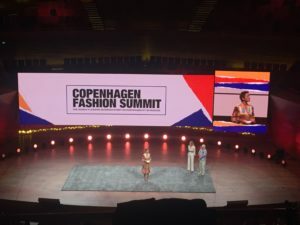 In mid-May this year, I had the pleasure of attending the Copenhagen Fashion Summit – to hear from and connect with the leaders in the global sustainable fashion industry. 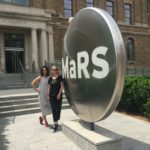 I was joined by Marilyn McNeil-Morin from the George Brown Fashion Exchange and her lovely friend Diane, along with my good friend and fellow sustainable design collaborator for over 10 years, Andrea Kantelberg of Evolved Living. 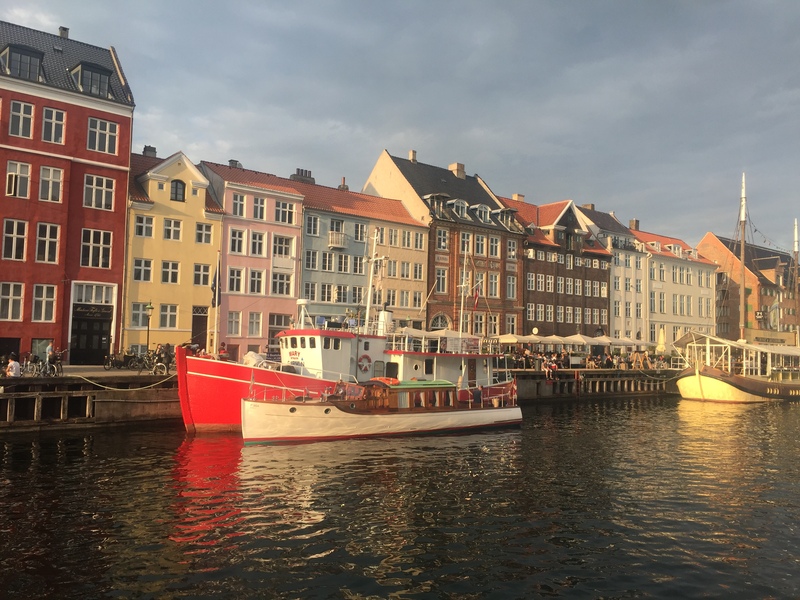 I absolutely loved Copenhagen – it was the ideal place to have a global summit on sustainable fashion. When we arrived and walked out from our hotel, SP34, we immediately felt the calm energy. 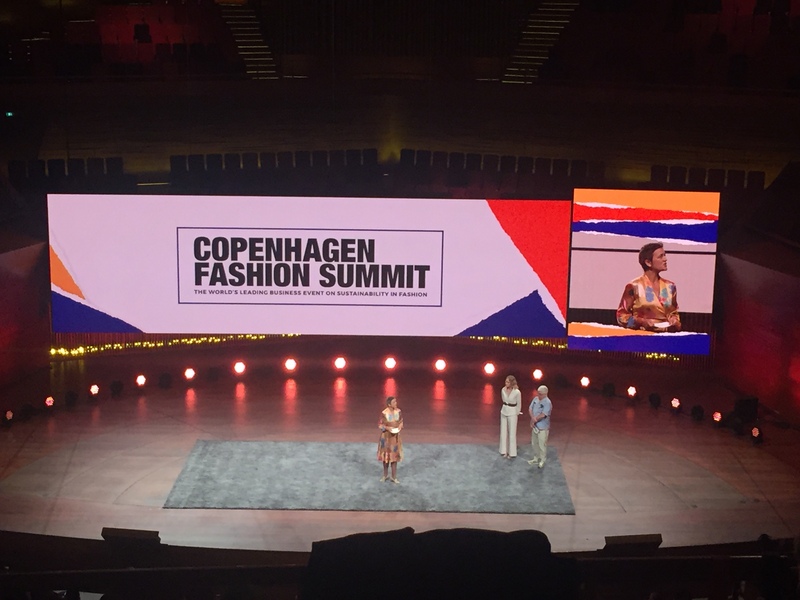 The sense of commitment to a more sustainable economy was demonstrated when the Crown Princess of Denmark presented a sincere, authentic, and in-depth speech about the sustainable fashion industry. As we entered the conference we found our seats high up in the auditorium but grateful for even attending. Then we were politely asked to leave our seats, and move to the front section on the floor. #seatfillers See the “after” image below with Eva Kruse, CEO and President of the Global Fashion Agenda. I was impressed with so many of the speakers, but specifically appreciated hearing from Margrethe Vestager, European Commissioner for Competition. She stated that if ANY industry can be innovative, creative and pioneering, it’s the fashion industry – who can take a basic form and turn it into something outstanding. 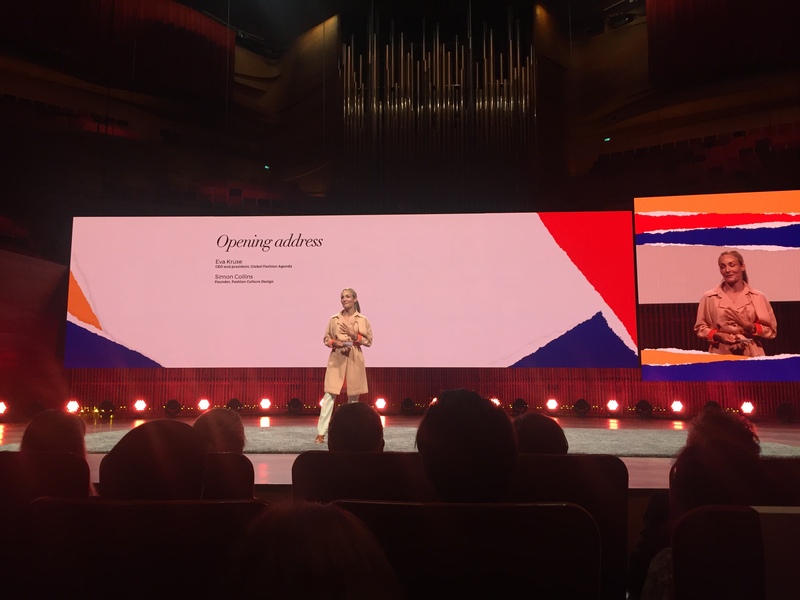 A systemic change is necessary but as a collective would have tremendous global effects, and she was confident the fashion industry the capacity to do this. 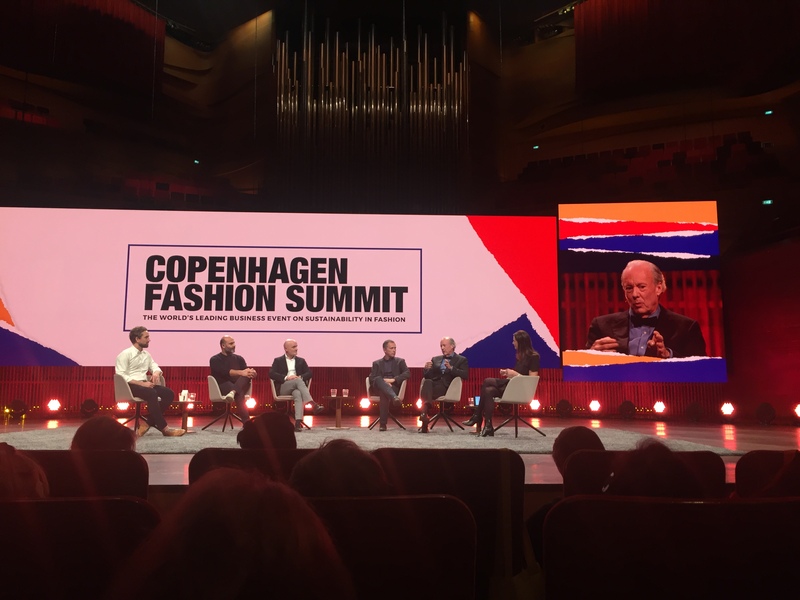 Another key highlight was the panel on Business Models for a closed-loop fashion system including William McDonough. His book, cradle-to-cradle inspired me over 12 years ago when designing a fully sustainable model suite (Tridel eco-suite) using Interface carpet tiles. It was with this experience we understood how to consider the end of use within the design phase. I was thrilled to hear last year that McDonough Innovation became part of Fashion for Good and that cradle-to-cradle garments are a reality. Also on his panel was Jeff Denby from the Renewal Workshop who works with brands to bring value to damaged goods or unsaleable returns by repairing them and utilizing the re-commerce marketplace. 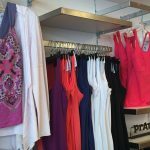 Brands like icebreaker and Prana can bring these good back up the value chain while being sustainable (avoiding what may typically happen to unwanted goods). Giulo Bonazzi, Chair and CEO of Aquafil spoke about their approach that they “start from waste” (e.g. fishnets) and that they look at value in the change not natural resources. Of course a highlight was the interview with Stella McCartney. I was really impressed with her grounded attitude and sincere approach to sustainability. 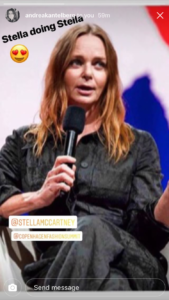 Her brand is definitely a leader and innovator, willing to work with innovative new companies to help them develop “proof-of-concept” models and to help these entrepreneurs gain credibility partnering with the Stella McCartney brand. Some examples are: working with Tipa using compostable bags for packaging, a partnership with Parley using plastic from the ocean for Adidas shoes, and working with ReVerSo to use recycled cashmere wool. Also, a very high profile partnership was made with the Ellen MacArthur Foundation to launch the report A New Textiles Economy: Redesigning Fashion’s Future, which I highly recommend reading to understand the sustainability issues in the textile industry and possible solutions. Another highlight was the conversation with Spencer Fung, 4th generation of the company Li & Fung. They recognized that the supply chain world is drastically changing and they needed to pivot to meet current and future demands. You typically think of “pivoting” with a start-up and not a 104 yr old company, but what they want to create is “the supply chain of the future” – they are on a journey to “disrupt themselves”. As an example, a VP of the company, Rick Darling stated that by moving to 3-D virtual design in the sampling process can reduce the ordering time by 20 weeks…the impacts are very significant as it is becoming increasingly important to manage inventory (and accompanying textile waste). Supply chain efficiency was also a key theme and what some referred to as a low-hanging fruit. Burberry, a luxury brand leader within the sustainability context spoke about using the NRDC “clean by design” program to help discover the 230 opportunities for water anod energy savings, enabling them to immediately take steps on,”quick, easy wins” while then focusing investment for innovations with the highest impact opportunity. You can see many of the speakers and panels from the Copenhagen Fashion Summit with the full videos located on their website. 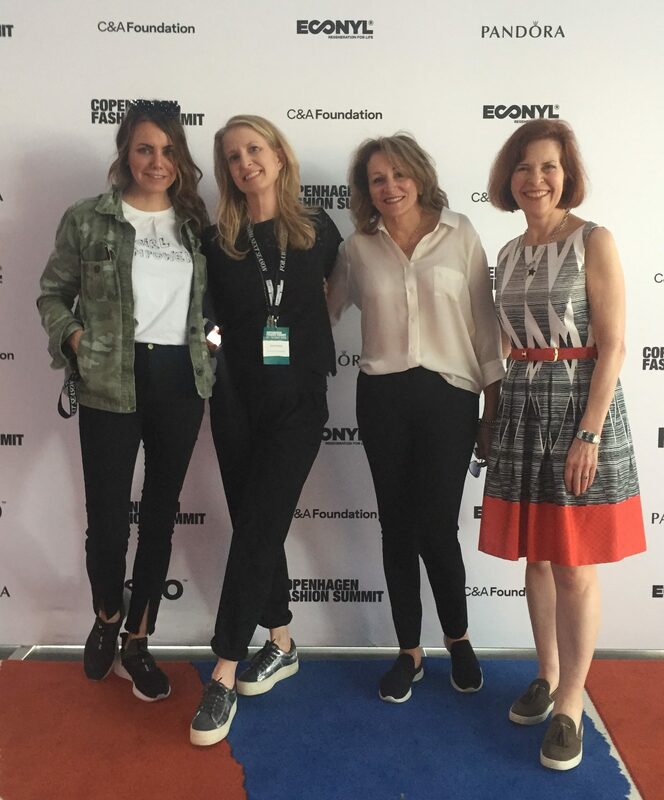 At Style with Substance, our focus is on connecting the innovation, investment and the sustainable fashion community in Canada, which made the innovation forum quite appealing. 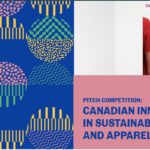 I saw some companies I already knew like Evrnu (Stacy Flynn was a keynote at the WEAR conference in Toronto last year) and was able to connect with companies I had been following like Scalable Garment Technologies, the first Canadian company accepted into the Fashion for Good cohort and Agraloop, an amazing company focused on transforming food-crop waste into natural fibre products. Others that I enjoyed meeting were environmentally-friendly dyeing solution ColorZen, (winners of the on-site pitch competition) and an upcycling yarn solution, Osomtex. Transparency – This concept was woven throughout many of the panel discussions. This is an area that seems to be well passed the “idea” stage as many companies large and small are recognizing the need to incorporate this. With digitization and access to more standardized auditing tools, the adaption rate will continue to rise. Supply Chain efficiency – This became apparent throughout the conference that there are some “quick wins” every company can achieve to reduce their environmental impact, by just starting the process and making decisions. Efficiencies are becoming more possible and accessible with the digitization and automation of certain facets of the supply chain. Standardized auditing systems – Even if the manufacturers are trying to make necessary changes to abide by vendors requests, they are inundated with so many different auditing systems for each client – being unneccsarily innecficient. Sustainable Apparel Coalition’s Higg Index is moving to also include social indicators and not just environmental. 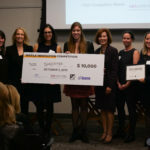 Revitalized business models – Companies like Renewal Workshop are leading the way, and starting to demonstrate success. With the onset of mid-size brands like Outerknown as well as sustainable brand leaders like Patagonia Worn Wear testing and incorporating new approaches, the large brands and retailers are taking notice. Small/ Medium sized companies can have significant impact – SME make less than 1/2 the market, but it is difficult for them to invest in sustainability initiatives. Ganni, a Copenhagen brand took an interesting direction by following a carbon emission framework and then paying for carbon offsets in carbon credits (it makes a difference when you need to pay). 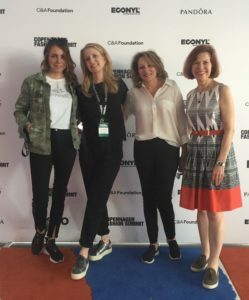 Overall, the conference was an incredible experience and we were able to connect with so many like-minded people trying to make a difference in this industry. 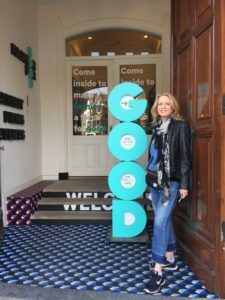 On the way back, with a stop in Amsterdam, we visited Fashion for Good and met Katrin Ley and colleagues….but that’s another story.